A trial on Wales’s highest mountain to help disoriented walkers may lead to fewer calls for help. Small plaques bearing grid references have been fixed to stiles and gates on Snowdon in an attempt to promote mountain safety. The Mountainsafe Partnership, which came up with the idea, hopes it will encourage walkers and other outdoor enthusiasts to use their maps and compasses and will help them work out where they are. The small discs, which bear the initial letters plus a six-figure grid reference, are already in place on many of the stiles and gates on the 1,085m (3,560ft) mountain. 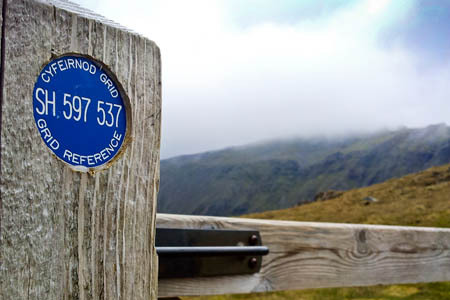 Snowdonia national park warden, Gruff Owen said: “The idea for placing grid references on footpath furniture originally came from local mountain rescue teams. “By working closely with recreation groups through the Mountainsafe Partnership we’ve developed the idea so that it’s as unobtrusive as possible. “The markers are being placed on pre-existing stiles and gates so that temporarily disoriented walkers who’ve brought a map and remember their geography lessons, will easily be able to pinpoint their position. John Grisdale, chairman of Llanberis Mountain Rescue Team added: “Although it’s rare for an incident to occur directly next to a stile or a gate, walkers often become disoriented and rescue teams spend hundreds of volunteer man-hours trying to locate people who are lost but unhurt. “These discs are a simple idea which will allow disoriented people to locate themselves and could prevent them from having to call us in the first place. Emyr Williams, director of land management at Snowdonia National Park Authority said: “I am very pleased that our new safety initiative is already proving popular with mountain users. The grid-reference plaques are the latest in a series of measures introduced to promote mountain safety in Snowdonia. Earlier in the year the Mountain Info Services Project was launched at the national park warden centre at Pen-y-Pass, aimed at giving mountaineers and hill-walkers access to electronic and digital information, as well as traditional safety advice. Along with a visible presence on the mountain the warden service also launched a Twitter service which updates users on potential risks and links directly to the Met Office’s weather forecast for Snowdonia. The Mountainsafe Partnership consists of Snowdonia National Park Authority, North Wales Police, Llanberis Mountain Rescue Team, the British Mountaineering Council, Mountain Training Wales, North Wales Mountain Rescue Association, RAF 22 Squadron and Snowdonia Active. What a simply Brilliant Idea,maybe it should be extended nationwide it could save so much time effort and money . Genius idea! Could be easily (ha ha) added to every footpath sign, style and gate across the UK. Just now needs for the nation to know how to use the grid reference on a map. Now all together... Along the corridor and Up the stairs! I can't help thinking that often the sort of people who get lost are the sort who can't read a map or don't have one, so quite what use this will be I'm not sure. But if the rescue aren't called out they would just spend more time in the pub. Oh I see, brilliant. The downside is that people will become reliant on them rather than learning how to use a map comprehensively. How about a covered up/down travelator too? After all, we must encourage as many under-equipped people as possible onto the mountain, don't you think? It would also serve as a subtle enhancement to that gorgeous piece of architectural beauty on the summit. This is a great idea, I hope this gets rolled out across the rest of the country. Sometimes even competent map and compass readers need a helping hand in challenging conditions! Great idea, handy for checking your GPS and making doubly sure you are where you think you are. Anything that's done to get people away from the TV and into the countryside is a good idea. Except that most of us go out into the hills to enjoy them for what they are, natural and on times remote, and to be self sufficient in that environment whatever the weather and this does somewhat detract from that ethos. I always felt that Petunias would enhance many paths. This idea has been rolled out along the SW Coast Path by Coastguard teams earlier this year. why not paint yellow lines for going up with arrows pointing the way and red lines with arrows pointing the opposite way for coming down,that way people will know if they are going up or down the mountain,now that's genius!